Follow the hi-viz jacket - our walk leaders will show you the way and help out where needed. The lake at Brandon Country Park is always a popular stop. A pub stop at the end of a walk is always welcome, especially on a hot day. Greyhound Walks are a group of greyhound, lurcher and other sighthound lovers who regularly meet for an hours stroll, a natter and the sharing of doggy tales in and around Essex, Suffolk, Norfolk and Hertfordshire. We always meet on the second Sunday of the month, at The Discovery Centre in Great Notley Country Park, Braintree, Essex. We also walk most other weekends at various locations in and around our counties. See the Walks & Events page for more details of our scheduled walks. Anyone with a greyhound, lurcher or other sighthound is more than welcome to join us. If you don’t have a sighthound of your own, why not join one of our walks and see what great pets they make? You could even take one for a ‘Test Drive’! Just turn up on the day and you’ll be made very welcome. There’s no charge to come on a walk but we do ask everybody to observe a few simple rules. Although our walks are free, we do have a voluntary contributions bucket. Money collected is used to cover our running costs and help sighthounds in need, primarily in Essex, Suffolk, Norfolk and Hertfordshire through donations and grants. We also donate to other needy sighthound causes, contact our trustees for more details. The first Greyhound Walk was held in April 2006 when Chelsea greyhound plus 4 other hounds and their families responded to a letter in the Braintree & Witham Times asking if local greyhound owners fancied a get-together. Numbers have grown and grown and we now walk in 4 counties 5 times a month. The number of dogs at each walk averages 60, but our record attendance was on 1st January 2013 when 244 hounds walked out together. support other greyhound and lurcher rehoming organisations who share our aims. 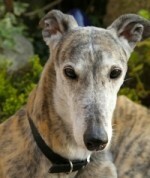 If you would like to make a donation to Greyhound Walks please use the Donate button below. Previously called the Great British Greyhound Walk, this annual event has now gone international! Visit the GGGW website for more details.